Strike Vector offers no story for the on-boarding player. 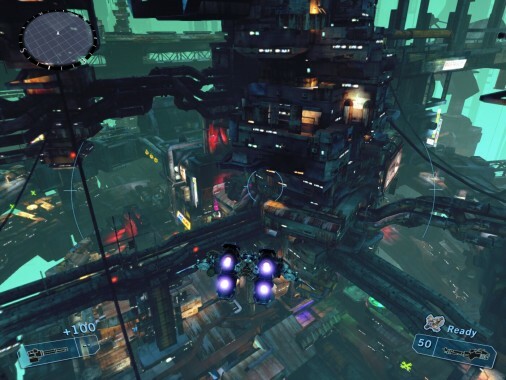 While the player controls a futuristic ship known as the Vector and can fly in different modes with it, the title only offers multiplayer and a single player “free roam” environment. The developers can probably attest that the reason a story was not included is because Strike Vector is pure multiplayer. I do feel there is a grand story left untold and that could have been accomplished through a single player campaign narrative. I am very intrigued to why a need for these Vectors were put in place and what evil is contributing to these “space dogfights”. 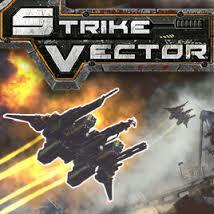 Strike Vector provides a strong foundation of game mechanics which allows the multiplayer to be successful. Some of the many attributes that feed into the successes and failures are: vehicle customization, multiple modes of play, special equipment, variety of weapons, weapon modifiers, palatable score system, and individual progression. First and foremost, the tutorial is presented as a 9-page slide that reveals necessary information for the beginning player. Unlike other human beings, I learn by doing rather than reading slides. An interactive tutorial on a “free roam” environment would be more helpful. At the home screen you may enter your “Garage” and edit your Vector’s appearance. As you progress with achievements and earn levels, new parts/decals will become available for you. Also listed under the “Garage” is the “Armory”. Once in the “Armory” you are able to select weapons, weapon modifiers, and special equipment to prepare for battle. Three presets are loaded into the “Armory”, so you may differentiate skills in the three sets to plan a strategy. Like most other FPS titles, you are able to access this armory after you die in combat. 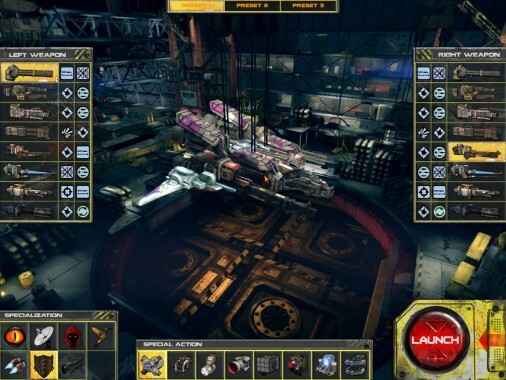 There are 8 different types of weapons that can be utilized for each side of the ship: gatling gun, plasma gun, shotgun, homing missile, rocket launcher, swarm missile, smg, and carabine. You can mix match between items to garner the ultimate killing Vector. Further customization is involved as players can then add perks to their weapons. For example, I can increase the damage dealt by homing missiles and increase their effective lock range. Still in the “Armory”, players can select a specialization and a special action. A specialization can be considered extra armor or to remain hidden on the radar until a Vector appears in the immediate vicinity. 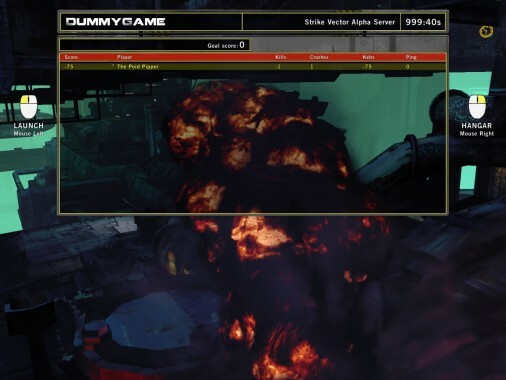 A special action provides the player with an extra goody such as an instant shield to block attacks for a short duration or a rocket booster to jet out of harm’s way. Both of these can also be altered after dying on the battlefield. Once you have entered a battlefield, you have two available modes to alternate from: Harrier Mode & Vector Mode. Harrier Mode allows you to fly around environments as a jet operating at high speeds (more potential to run into things and die). Your mouse becomes the main vessel of movement as you are directing the spacecraft to move where you are pointing. Meanwhile, you may press the default spacebar button to switch to Vector Mode which halts the vehicle completely. Vector Mode provides limited mobility left to right as well as up and down but in different ways. The mouse is now used to rotate 360 degrees about your position. A, D, and your mouse’s scroll wheel cover the strafing left/right and propelling up/down. By mastering both modes of transportation, you will surely become a force to be reckoned with in the skies. Both commendable and frustrating the in-game scoring system can easily favor the more skilled player. In deathmatch scenarios it is the team or person with the most points/kills that wins the round. However, the problem that fresh players will encounter is that for every time they crash their Vector – not killed – their kill total reduces by 1. Therefore, if said newbie killed 0 people and crashed 5 times, his/her score would be -5. I suppose that is fair enough, but I warn you it will happen a lot. After the completion of a match, your profile will receive awards/accolades for performing well or not-so-well in the game. These points consecutively add up to help you gain new levels which then provide in-game art, Vector decals, and Vector parts. Nothing really stood out for me as amazing in regards to the audio files. Music plays as expected throughout the background of menus and alternates tracks when going to your garage and credit screens. However, I will mention that a lot of thought process must have been placed in applying sound effects. With multiplayer as the title’s focus, importance of timing and variety of effects is crucial to meet player expectations. And I believe they met that standard in delivering consistent as well as varied sound effects. Where other parts of the game struggled to shine, environments truly stood out as engineered masterpieces. Whether you are traversing through a torn-up city or mangled space platforms, you will experience intrinsic design that can alter your flight path instantly. Your job to navigate and attack enemies becomes a harder but that also means you may place more longevity to your own life by taking unsuspecting twists and turns through map obstacles. 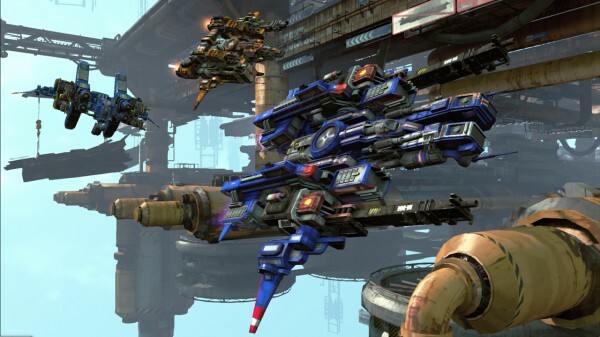 As a pure multiplayer title, Strike Vector performs as it is suppose to. It delivers high velocity battles across several maps and game types. Yet with all other contributing factors towards gameplay, a single player campaign would have lessened the learning curve and enhanced the overall experience of this particular FPS. Additionally, I personally would have a hard time coughing up $24.99 for a pure multiplayer title. There is no ‘ease into’ button for Strike Vector. You simply are thrown in to wait – not long – and die several times before figuring the game out. I will end on this final note though: Death may be imminent, but the subtle chance for a kill urges players on to play just ‘one more game’.